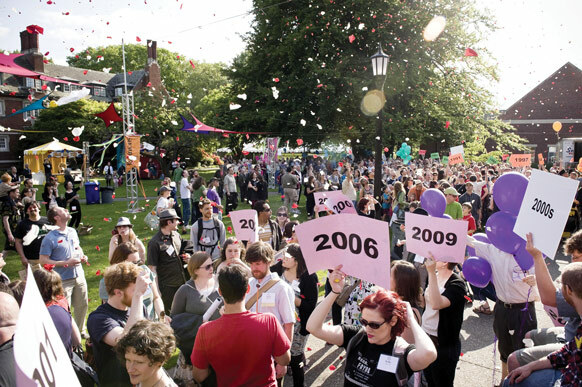 More than 2,600 alumni and guests descended on Reed June 6–12 for Reunions 2011, which marked the biggest gathering of the Reed tribe in recorded history. The weeklong celebration included no fewer than 232 events, ranging from a Reed opera (inspired by Gilbert & Sullivan) to an ’80s-vs-the-world rugby match to a keynote address from poet Gary Snyder ’51. Alumni thronged the dorms (every room was filled), barbecued on the quad, and boogied in diverse and sundry ways, from pioneer reels to riot grrrl romp to New Orleans blues. One reason for the surge in attendance was that many alumni jettisoned the needless obsession with quintuples and decided to make it “their year” regardless of the technical date of their 20th, 25th, etc. reunion. “People from all vintages are always welcome at Reunions, whether it’s a milestone year for them or not,” says Mela Kunitz ’87, assistant director of alumni & parent relations. Save the evening of Thursday, September 15, for Reed Diaspora Pizza, when alumni around the globe welcome new grads into the fold. Help us celebrate the class of 2011 as they join the Reed diaspora, leaving campus for cities far and wide (or good old Portland!). Visit www.reed.edu/alumni/chapters/pizza.html for the list of locations. 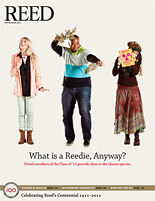 Are you newly graduated from Reed and moving to a new community? Would you like to touch base with local alumni who can help you navigate unfamiliar waters? Are you a knowledgeable local alumnus/alumna who is willing to take an occasional call or have coffee with a fellow Reedie who is new to your area? The “local hosts” option within IRIS (iris.reed.edu) is the key to connecting! By checking the “Alumni Local Host” box on the volunteer page, you can let your fellow alumni know they are welcome to contact you (via the preferences you have set for your personal directory listing). Interested in finding a willing contact where you’re going? Go to the bottom of the directory search page and limit your search accordingly, or send an email to Ian Atlas ’91 at ian.atlas@alumni.reed.edu. The weekend retreat at Camp Westwind for alumni and their families, sponsored by the Portland alumni chapter, will be October 14–16, 2011. Join alumni from a variety of eras and swap Olde Reed stories and songs in a beautiful forested setting on the Oregon coast. A limited number of reduced-rate spaces are available for kitchen and cleaning crew people. For details and registration, please see www.reed.edu/alumni/westwind/.